Russia smashed the World Junior and meet record in the mixed 400-meter medley relay at the 2015 FINA World Junior Championships. Russia’s Irina Prikhodko, Anton Chupkov, Daniil Pakohomov and Arina Openysheva won the finale in 3:45.85. 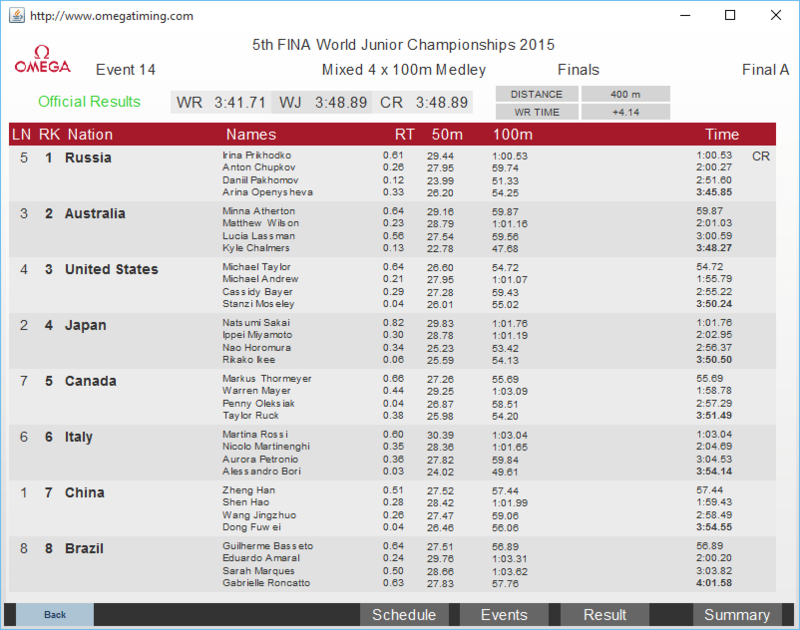 That swim blasted the previous World Junior record of 3:48.89 that also stood as the meet record since 2013. Australia’s Minna Atherton, Matthew Wilson, Lucia Lassman and Kyle Chalmer finished second in 3:48.27. USA’s Michael Taylor, Michael Andrew, Cassidy Bayer and Stanzi Mosely snared bronze in 3:50.24. Japan (3:50.05), Canada (3:51.49), Italy (3:54.14), China (3:54.55) and Brazil (4:01.58) also competed in the final. How late may coaches make adjustments to relay entries? Whether by illness or event fatigue, Michael Andrew showed that he should not have been on this relay at the end of the session, if adjustments could be made. Coming into the meet no one would question he was deserving of a leg, but this night he was beaten by Taylor in 100 Back, by Whitley in 100 Breast and by Ryan Hoffer in 100 Fly. I’m sure he gave full effort, but with the way he was swimming throughout the session, putting Andrew on the relay was simply cruel both to Michael and to the US squad; the American team would have been better off with Whitley. Interestingly, Bayer was only one who hadn’t yet swum 100 of their stroke in the meet but her mid-:59 split was apparently quite predictable as she had swum the 200 already and was 2 seconds off her best time, roughly equivalent to being 1 second off her 100 seed; putting her in at around 1:00.00 flat start, with Lauren Case seeded at :59.70 (had done 60.3 in prelim relay leg.) So many choices! Would have still been short of Russia (59 breast and 51 fly hard to combat) but could have been in race with Australia for Silver (could have been fun to see Rooney trying to fend off Chalmers at the end), and possibly 2+ seconds ahead of time they finally did. Usually at these meets the relay order needs to be submitted before the session starts. When I was at worlds, all relay names were listed on Omega before the sessions started. I think the only way someone could get replaced after submission is for medical reasons. This is probably the case at US nationals, NCAAs, etc.